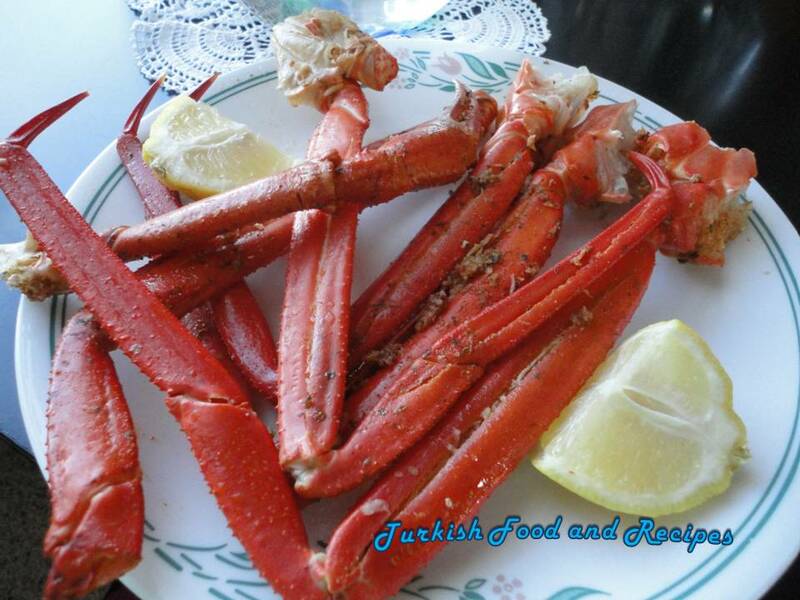 If desired cut a slit, length-wise, into the shell of each piece of crab. Otherwise, place all the crab clusters into a pot and add the other ingredients. Make sure the water half covers the crab clusters. Bring to a boil and close the lid. Steam for about 6-7 minutes over low-medium heat. Serve hot with the butter dipping sauce. Arzu edereseniz yengec bacaklarinin boyuna dogru bicakla bir cizik atin. Ya da oldugu gibi buyuk bir tencereye alin. Diger malzemeleri ilave edin ve harmanlayin. Yengec bacaklarinin yarisina kadar sicak suyu ilave edin ve sonra kaynamasini bekleyin. Kapagi kapali olarak kisik ateste 6-7 dakika pisirin. Tereyag sosu ile birlikte sicak servis edin.